Not only is it tasty and nutritious, it can also be made in a jiffy. But regardless of when you serve it, your family will absolutely love it. And since it’s made with fresh, delicious Hiland Dairy milk and cheese, you know it’s going to be good – and, as always, with NO artificial growth hormones! Preheat oven to 375°F. Lightly coat an 8×8 casserole dish with nonstick spray. Arrange the ham, potatoes, spinach and cheese in the bottom of the casserole dish. 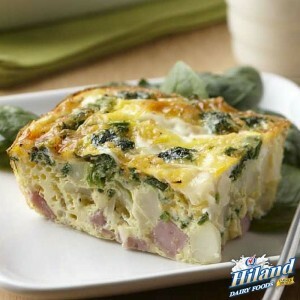 Beat the eggs and milk together in a large bowl and pour over the ingredients in the casserole dish. Bake 25 to 30 minutes or until lightly browned and puffed. Serve immediately with a tall glass of Hiland Dairy Orange Juice. Print your online coupon for Orange Juice now (available until March 1, 2015).